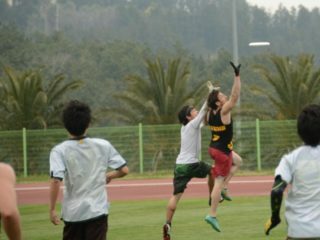 Coming to Japan, the only “culture shock” that I was worried about was finding a good pickup game of ultimate. Unlike many of you amazing athletes reading this, I never played in college or trained with a team. I’m a pickup player through and through. I started with a crew of friends, orange Home Depot buckets for cones, and fields of patchy, dubious quality in sunny San Jose. By the time I left California, I was playing pickup four times a week—twice on the beach, twice on the field—and running plays as a handler. Nothing made me happier than watching a newbie, some long-distance runner who was still learning how to throw a backhand, streak into the endzone for a point. 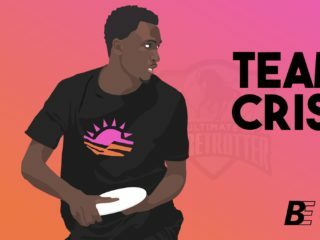 I loved ultimate, and it had made me a better, more giving person—it had changed my life. Online, before my flight to Japan, I was messaging every group I could find about a game. I came up with nothing. Some groups existed, but they were tourney focused machines working their way toward that well-oiled stack and cup play that I had never quite figured out. In the past two years since my arrival, I’ve campaigned—talking to everyone I can, going to social events literally for the express purpose of talking about ultimate—in order to get small pickup games going in Takasaki, the biggest city of our prefecture. It’s two hours on the train for me, but I’ve been able to draw fifteen to twenty people, almost all of them absolute beginners, out into the sun to toss the disc. Honestly, I came to Japan because life in California had gotten a bit stale. My time on the field was rewarding and great, but off the field, I felt like I was in a rut. I had been tutoring kids for a few years and thought that teaching English in a foreign country would mix things up. It certainly did, but no matter how settled you get in a new place, there’s always something missing. For me, it was always more ultimate. A couple years after I got here, we were making progress in our pickup games. A bunch of my crew had started to message me regularly, asking when we’d get out again. It made me happy every time people showed up, watching them fall in love with the sport–seeing that first end run, sliding layout, or point scored. I figured it was enough, these five or so games a year. At least, I did until I met a businessman in my adopted hometown. He threw a shindig at a local restaurant, wining and dining the local foreigner population and asking what he and his friends could do to increase international tourism to our little town. Tatebayashi is fairly beautiful—with sakura blossoms in early April and a few festivals to its name—but it isn’t a draw by any standard measure. There are no world heritage sites here, and the azalea festival, which centers around a walk in the park, looking at—you guessed it—azaleas isn’t quite the ticket for people who want to truly experience Japan. When he popped his question, I was ready. I took a disc out of my bag and asked him if he’d ever heard of ultimate. “Foreigners love it,” I said, mentioning the Tokyo Ultimate crew (with whom I’d trekked the 3 hours to play a few times), and my own budding disc enthusiasts in and around the prefecture’s capital. “We could have a tournament.” We tossed the disc—and the idea—around for the rest of the night. I already knew what I wanted. There was only one vision that I had for this tournament, only one shining example that I aspired to emulate: Hats, Hops, Hucks. It’s a tourney with hat rules—as in, no hat, no play. If your hat falls off, it’s a turn over. These aren’t normal hats, either. We’re talking fun hats. Massive foam rubber things, or the kinds of hats you buy at Disneyland, wear around the park, and then try to pretend you didn’t actually waste $30 on. My plan was to drop the rules pertaining to hats (too complicated to explain), but to keep the hats–and with them, the spirit of those California games. This thought wasn’t a passing fancy, though. This was a necessary, intrinsic part of my plan. To understand why you have to understand something about Japan’s attitude toward sports. From the outside, Japanese sports don’t look like a lot of fun—they look like work. At the middle school where I work, kids come to school shortly after 7 AM and practice before class. 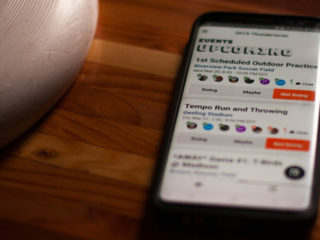 They stay after school, too, in nearly all weather conditions, coming even on Saturdays and the occasional Sunday to crank out a few more hours of throwing a ball or swinging a racket. These kids work hard—really hard—and adult sports look much the same. Those well-oiled tourney machines I mentioned before? That’s how they’re trained for all the traditional sports, and if they play ulti in college, they’ve got the same look in their eyes when they see a disc. Although ultimate is a little more relaxed because of the later stage in life that Japanese people pick up the sport, a game of pickup—no training, no drills, just getting your cleats dirty for the sake of fun—is really hard, if not impossible, to find. It took me months of messaging, reaching out to Club Jr. and talking to my friends, before I was ready to pull the trigger on the tournament. Eventually, Club Jr. settled on a day that they could come out to support us and I went to my man in town. We arranged to meet up, and before long, he had assembled a team of local businessmen. They had watched YouTube videos about ultimate beforehand, and I showed them pictures from my last outing at HHH. 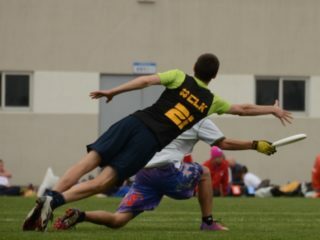 “There are a ton of frisbee tournaments here in Japan,” I said. “We must be different—we must be fun. We must have hats.” To my surprise, they understood my broken Japanese, and, more importantly, my reasoning. Let’s gloss over the details a bit here, but suffice it to say that I spent several hours of every day, from January 5th (the day after my school’s winter vacation) to April 7th (the day of the tourney) messaging people, writing emails, posting to Facebook groups, drawing up t-shirt designs, making banners, clarifying the details, speaking Japanglish with newspaper reporters, and working on every conceivable thing I could do for the tourney. I met up with the guys at other restaurants on other nights and hashed out the details of what could and couldn’t be done. At one meeting, a special guest member, a fellow ulti player from the capital, mentioned that maybe we could get more players if the tournament became a team tourney—y’know, bring your team and play. Luckily, the guy who had been enlisted to translate for me was more diplomatic than me. What I said was, “if you change it to a team tourney, I’m out.” What he said was more akin to, “maybe we can make the second day be devoted to teams. The first day is hats.” I was okay with that. After plenty of hiccups and a lot of unexpected spending—prizes for players cost how much?—we arrived at the day. The guys and I chalked the lines ourselves in torrential winds and prayed that it’d die down before the discs started flying. When the morning of the tournament arrived, the weather was mostly calm, but threatening rain. A cable news team had shown up to interview the players, and another newspaper reporter was walking around with a pad of paper herself. Club Jr. brought us extra tents in case the rain came down as well as the tourney shirts that they had gotten printed for us. When the players arrived, they represented a dozen different races, including 30 or so locals, and claimed true hometowns around the world and local hometowns up to fifty miles away. Sixty people in all ended up coming, from age seven to well over forty. They had heard the message: that this was a tournament for people who didn’t have teams, who wanted a return to the spirit of the game, that feeling of being barefoot in the park with your best friends. They wanted a return to the community of ultimate, where we’d eat barbeque burgers after the winners had been declared. They brought their hats, too. Sharks eating people’s heads, local prefectural mascots, hats with spinners and umbrellas, flowers and googly eyes—they were all there. They came to have fun. Even the coach of Japan’s national team, who lives in the capital near where I arrange pickup games, came and brought his family with him. In a pink, flowered hat, he D’ed the only hammer (a low, terribly chosen bullet, cross-field) that I threw in the tourney. The only difference between this and the last time we had played together was that this time, he did it with a smile on his face. People heckled and laughed, they made new friends. Pros had come out and they certainly led their teams, teaching everyone little tidbits of what it takes to go to Worlds, but they still passed to the newbies, the kids, and the ladies (who are sorely lacking in a normal mixed-gender tournament). Games were low-scoring, but every miss was so close you could taste it. After the tourney, they ate “California style” burgers (I made the closest approximation to In N Out’s spread that I could) and drank beers. The teams mixed and chatted together, some of them staying out until well after midnight. When I had gone before, to another tournament with the local crew, we’d stuck to ourselves. Our team on the field was our team after the game and in the bar after that. I never even learned the names of any of our opponents, let alone what their favorite drink was. 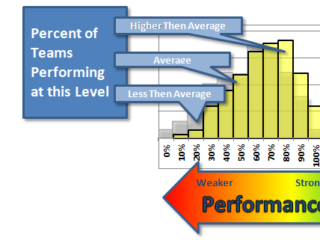 This was entirely different, not just for me, but for many of the players, too. I’m proud to be here as a teacher, and I’m definitely proud of the work that I do on a daily basis, but nothing at school has ever felt as good as hearing that. As of now, I’m preparing to leave the country (three years is a long time to live in a place where you only half-speak the language), but I hope that this tournament will represent the lion’s share of my legacy. In an interview with the TV reporter, one of the organizers said that he wanted people to think of Tatebayashi as a fun town. He wants the name to become synonymous with this tourney, with the fun that can be had here. Maybe only 60 people came out this year, but in some small way, I changed the social landscape of this place. I changed Tatebayashi the same way that ultimate changed me—bringing true fun and a reminder that life doesn’t always have to be so serious. Here’s hoping that spirit lives on, with or without me, everywhere the game is played.